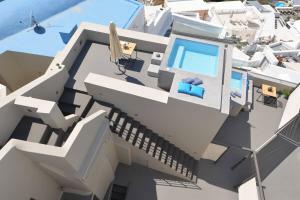 The Aria Suites is an elite boutique hotel that offers its guests a luxurious accommodation in the center of Fira, in Santorini. The Tosca suite has a spacious living room, a private terrace with sea views, and a bathroom with shower. A free beach bag is provided with pool and beach towels. The La Boheme suite features 2 bedrooms, a spacious living room, a private terrace with sea views and sun loungers, and a bathroom with a shower. A free beach bag is provided with pool and beach towels. The Carmen Suite has 2 separate bedrooms, a spacious living room, private terrace with sea views and sun loungers, and a bathroom with shower. A free beach bag is provided with pool and beach towels. The Aida suite includes a spacious living room, private terrace with sea views, and a bathroom with shower. A free beach bag is provided with pool and beach towels. Norma suite has 2 independent bedrooms, a spacious living room, private terrace with sea views, and bathroom with shower. A free beach bag is provided with pool and beach towels. The Rigoletto suite includes a spacious living room, private terrace with sea views, and a bathroom with shower. A free beach bag is provided with pool and beach towels. La Vida Breve is a villa of 60 m² located on a cliff, in the center of Fira and La Caldera, less than 100 meters from the suites. 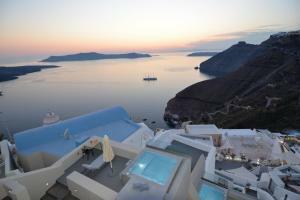 The location offers absolute privacy and panoramic views of the volcano, the caldera and the Aegean Sea. The villa has a private hot tub on the balcony. This villa offers views of the caldera and features a balcony, satellite TV and a seating area. This villa offers a balcony with views of the caldera, air conditioning and a spa bath. 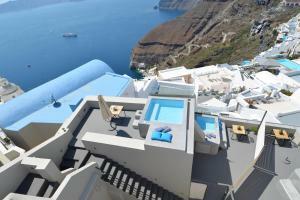 This villa offers views of the caldera and features a balcony, a minibar and a flat-screen TV.